During today’s Environment and Public Works Senate Hearing on rural climate impacts, Senator Inhofe made a statement that — if it weren’t so telling of the fundamental problems in Washington, D.C — would by funny. He made a valiant attempt at cherry picking the facts, calling out the ‘big money’ being spent to promote renewable energy. Distorting reality is nothing new for Senator Inhofe who has famously made a name for himself denying the scientific consensus on climate change. What made his remarks particularly poignant was the major Senate Judiciary Hearing taking place down the hall discussing a potential constitutional amendment repealing the Citizens United and McCutcheon Supreme Court rulings that removed campaign finance limits. Senator Inhofe is right, money in politics is one of the biggest problems facing our increasingly fragile democracy, but he gets the root of the problem entirely wrong. 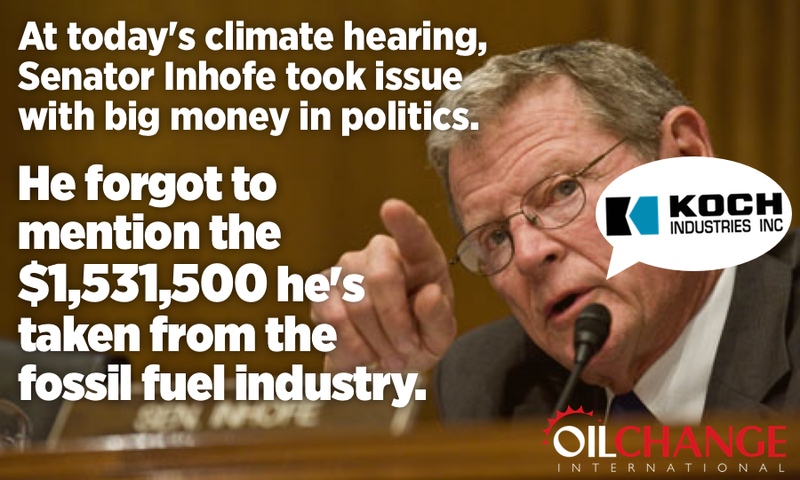 As Senator Inhofe already knows, his campaign coffers are overflowing with industry money. According to our dirty energy money database, he has taken $1,530,500 from the fossil fuel industry during his career — that’s 33 times the median annual household income in his home state of Oklahoma. If Senator Inhofe wants to point fingers at the problem of big money in politics, he should do it while standing in front of a mirror. The other possibility in all this is that Senator Inhofe has finally woken up to the problems he has helped create. If that’s the case, we greatly look forward to Senator Inhofe donating his $1.5 million in dirty energy money to a worthy cause. He is taking money from foreign corporations. He is representing foreign corporations, not American citizens. Therefore, his actions and ethics are unamerican, and he should leave office and make restitution. So what is new in politics. We the people have been long suffering taxation without real representation. The system did not just break yesterday, it has been broken for a long time and is in need of a complete overhaul. We have two pretend parties, both with the same goal, cater to the wealthiest at the expense of the rest. There is a reason why government hires 3 to 4 times more personal than they actually need and it is the same reason that the police have become a paramilitary force in our own backyards. We The People are not only guarantied the right, but we are charged with the duty to make what changes we deem necessary for our best interest to our Government, but now if you speak out too loudly without being politically correct you can be detained indefinitely as a accused terrorist. I guess a true Patriot would be terrifying to these who get so much and do so little, with no accountability, responsibility or consequence for their acts of corruption and open rebellion against We The People, who have the inalienable right to Life, Liberty and the pursuit of Happiness. These foolish servants think they are the masters. We need to put them in their places. I will never waste a vote again by trying to choose either the left or the right hand of the devil. I will vote independent party just to screw both parties out of a vote. Some people have short memories or an early onset of other problems he seems to forget he took money from another Country Maybe that is different!! Well be sure to vote him out next time No forgetting! !